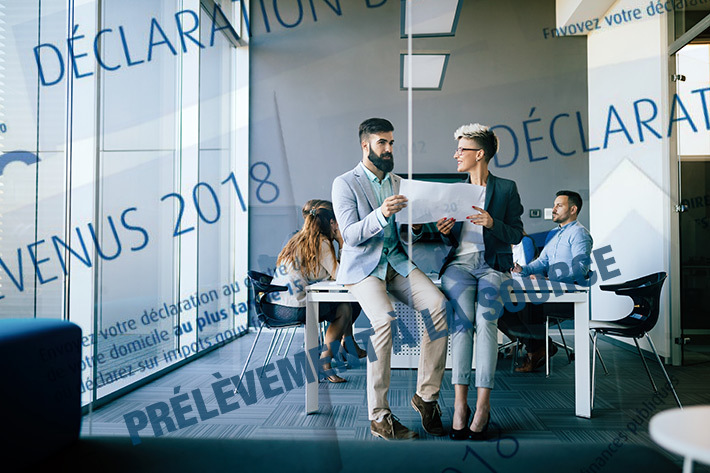 “Withholding tax” (in French, PAS – prélèvement à la source) came into effect on the 1 st of January 2019. This is not a new tax, but the new mechanism for collecting tax on the income received by taxpayers. This great novelty aims to adapt to the lives of taxpayers (birth, marriage, PACS, death…), so that they pay their income tax in the year of collection of these revenues and no longer with a delay of one year. This reform will be levied each month for the payment of tax instead of having to pay each quarter, so it should improve the purchasing power of taxpayers and limit the impact of income tax. This reform is not intended to increase the amount of the tax, the progressive scale will remain applicable, credits and tax cuts will be retained and the tax situation of taxpayers will always be considered (married, those in civil partnerships, separated, widowed, single, with or without children…). If you are an employee and thus receive wage income, for example if you are employed as an administrator in a French real estate company, your employer will usually be the company, it will pay you each month. Your employer will be given a rate of deduction that will have been calculated and transmitted by the tax authorities. This rate will be established through the income tax return filed in 2017 filed this year by you or completed directly online on your individual area. The employer will apply this rate on your pay slip; the levy will be automatic. Of course every year, every taxpayer will have to continue to file an income tax return (always online or in paper form). This return must always be filed by mid-May (provided the time limit is not reduced or increased), it is on the basis of this declaration that the tax administrator may update the applicable tax rate, this statement will be used to take into account new changes in your life (birth of a child, marriage, civil partnership, divorce, death…). The amount of the tax rate will adapt to your situation, if your income increases it will increase, if your income decreases it will decrease. An important clarification – the tax rate can be personalised (individually or by household) or not personalised, it is said that it is personalised when spouses can opt for an individual tax rate instead of a single tax rate for the two spouses of a household. The rate is not personalised when you do not want your employer to know your real tax rate, for example if you receive wage type income and next to that you earn significant property income (for example) you can request that your employer apply a deduction rate taking into account only the wages they pay you, you will be directly liable to the tax authorities for an amount corresponding to the difference between the rate applied by your employer and the rate that should have really applied to you taking into account all of your income. So that there can be no doubt in anyone’s mind, let us reaffirm that in 2019 you pay your income tax collected in 2019, normally you would have had to pay your income tax collected in 2018, in 2019. However if in 2019 you pay a tax on income earned in 2019 and a tax on income earned in 2018, you would be subject to a double tax obligation, since you will not be taxed on income earned in 2018 and declared in 2019 but only on the revenues collected in 2019 for the year 2019. The legislator set up a tax credit called the Crédit d’Impôt Modernisation du Recouvrement (CIMR), so that the tax due on my income received in 2018 and falling within the scope of the reform is cancelled by means of a specific tax credit. Excluded from this scope of the reform are: capital investment income, real estate capital gains, capital gains from the sale of securities, capital gains from disposals of tangible or exceptional movable assets. You are a company that employs employees, the administration has certainly communicated to you the applicable rate for each of your employees. Therefore, it is sufficient to apply this rate directly when the wage is paid, it will appear on the pay slip of the employee, it will then be necessary to withhold the withholding tax on the net salary to be paid for the month N, while applying the rate to the net taxable salary. It will then be necessary to declare the amounts deducted for each income recipient. The last step will be to pay, one month later (N + 1), the withholding tax of the previous month (N) to the tax administration. Obviously in case of error on your part when applying the rate of PAS for the wages of your employees (transfer of the PAS to the DGFIP or other), you will be responsible, the same as in a case of error, for the amount of social contributions deducted on behalf of employees. If your employee does not agree with the rate applied, it is not up to you to respond to them or change the rate transmitted by the tax administration, they must directly refer to the services of their relevant tax administration. If you employ a housekeeper, a maternal assistant or a home-based employee, know that nothing changes in 2019, no PAS will apply to the salary of your employee. However, as of 2020, this will be modified, however this will be the subject of very simplified schemes inspired by the schemes that you must already be familiar with (CESU, PAJEMPLOI..). As a result, in 2019, you will continue to declare to PAJEMPLOI or CESU centres the number of hours to be carried out by your employee as well as the net salary that you wish to pay them. As a result, the employee will not be subject to PAS in 2019, but from September 2019 a deposit will be deducted. This deposit will be established in view of the tax declarations made by your employee and the amount of revenue received in 2018 declared in 2019. If you have employed a home-based employee in 2018, you will keep your personal service tax credit and you will receive a 60% deposit in January 2019.